Tune-ups: If it’s time for your auto tune up in Stevens County, WA, come on in to and we’ll get your vehicle in perfect working condition again, enhancing your mileage and preventing future breakdowns. Engine rebuilds: As your expert mechanic in Stevens County, WA, we’re happy to provide complete engine rebuilds in addition to our general auto repair services. Our technicians work efficiently and with great precision to equip your vehicle with a finely-tuned engine for optimum performance. Towing: We’re happy to provide towing in Stevens County, WA, and throughout the surrounding areas, including Spokane, Newport, Colville and many more locations. 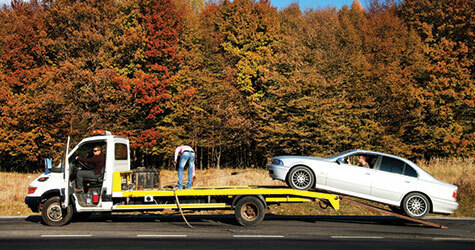 Our truck is equipped to handle any vehicle promptly and efficiently. Alignment and suspension: We’ll get your wheels perfectly realigned so you can drive safely and improve your gas mileage, and to improve the smoothness of your ride and ensure the safe drivability of your vehicle, we repair the shocks and struts on both two- and four-wheel-drive vehicles. Brakes: If your brakes aren’t working perfectly, don’t hesitate to come in for brake repair or a brake change. We’ll restore the immediate response of your brakes so you can drive worry-free. Mufflers and exhaust systems: Whether you need muffler repair or replacement or exhaust tuning, our expert technicians will increase the power of your vehicle’s performance and give you a smooth, quiet ride. Batteries: We offer top-quality batteries so you’re never stranded on the road with a dead one. Our battery changes are fast and efficient to get you back on your way as quickly as possible. Air conditioning systems: Being without air conditioning is a miserable experience in our region, and one you don’t have to endure. We provide affordable air conditioning repair so you can drive on in comfort. If you need a tune-up, general auto repair or the immediate service of a tow truck in Stevens County, WA, just call Fred’s Automotive & Towing at 509-276-5490.